When I was younger, I was a server, trainer and manager in a very busy restaurant in Atlanta. There were days when I was on my feet for 6-8 hours at a stretch with no break. Because I was in my 20’s, I was able to tolerate the abuse I put my poor feet through. When I was in nursing school, I was in my late 40’s and being on my feet all day was a lot harder than it was 20 years ago! When you are working in a hospital, you can work a 12 hour shift and only get to sit down a few times. My oldest daughter is training to be a hair stylist and colorist and she is on her feet for 8-10 hours at a stretch. 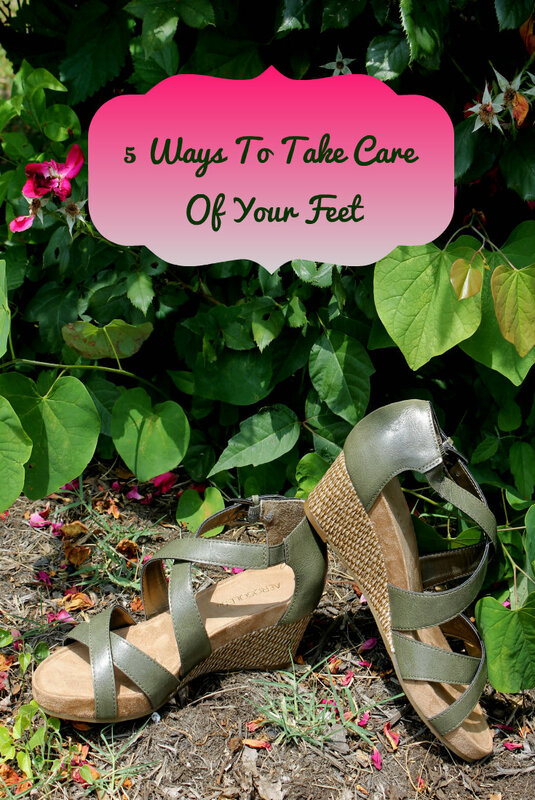 I was able to share a few of the tips for caring for your feet I learned when I was on my feet a lot. Chelsea tried them and she said it has made all the difference in the world. If you are a busy mom who is running all day long or you have a job that keeps you on your feet a lot, you may benefit from these tips as well. Move Your Feet: If you are like my daughter, you are standing in one spot for long periods of time. If this is the case, moving your feet and toes are important. Wiggle your toes, stand on your tip toes and rock back and forth on your heels while you are standing. This will help tremendously. Prop Your Feet: Feet tend to swell when you stand on them all day. In order to reduce this swelling, prop your feet whenever you get a chance to sit down. This can alleviate the pressure and can help lower your risk of clots. Massage Your Feet: When you are able to take a break and get off your feet, make the most of it! Slip your shoes off and give your feet and toes a good massage. This gets the blood flowing and circulating, which feels good and lowers that clot risk as well. Support Your Feet: If you are on your feet a lot, you need to give them the proper support. Choosing a good pair of shoes is key, but you may need a little added support. Your local shoe department or store can recommend a good insert for your shoes. A good gel support will make a world of difference for your feet! Cover Your Feet: The number one thing you need to do when caring for your feet is to get yourself a good pair of shoes. You want to find a pair that fits well, is made to last and are built to protect your feet. I highly recommend the shoes from Aerosoles because not only are the great for your feet, but they are darling as well! I learned about the benefits of wearing Aerosoles when I was in nursing school. A dear friend, who had been a nurse for almost 30 years, told me the best thing she ever did was buy a few pairs of Aerosoles shoes. She told me it was so difficult to find shoes which could withstand the constant wear and tear she put on them. She went on to say how hard it was to find a pair of shoes which were not only comfortable but fashionable as well. With the shoes, sandals, boots, mules, wedges, pumps and other shoes from Aerosoles, you get style, comfort and affordability. The American Osteopathic Association stated, “One in ten women wears high heels at least three days a week.” As a result, long term wearing of these shoes can lead to permanent foot problems down the road. With the innovative Heel Rest Deign technology, which is exclusive to Aerosoles, your weight is distributed toward your heel, and away from the ball of your foot. This gives you superior comfort in both high heels and wedges so you look and feel great. I chose the adorable Enlighten Sandal in green, which sell for $60 on the Aerosoles website. You can also find the Aerosoles brand at Macy’s, Famous Footwear, Shoe Buy and many other fine shoe retailers. This spunky little sandal has a 2″ raffia-covered wedge, contrasting crisscross straps and a side buckle entry. The flexible rubber sole and padded insole keep your feet feeling wonderful all day long. If you are looking for a company who cares about your feet as much as you do Aerosoles is the place for you! You can trust them to keep your feet feeling as good as they look! Be sure to follow Aerosoles on Twitter, Pinterest and Instagram. What tips for caring for your feet do you swear by?